Between 3 and 5 January the old male leopard (Pantera pardus tullianus Valenciennes, 1856) was killed by a local hunter at chance sighting in a forest on the banks of the Talas river near the town Toguskem (43o55ТN/70o25ТE). This is in the Mujunkum desert. The carcass has been stripped, the fangs broken, the haed discarded and the hide given to the regional administrator. The hide measured 1.58 m from nose to tail. The tail 1.05 m. The general colouring of the skin was light yellow to brown. The belly and inside of the legs were white. There were black spots all over the hide. The shoulder blades and flanks of the leopard were covered with rosettes while the spots on the back, bally, paws and tail were solid. The hair cover was rich and short. The skin showed no sign of wear, showing that the animal had not been kept in captivity. From the sizes of the hide and especially from the hardened cartilage tissues and scars on the nose, the leopard must have been old. The Hunting Inspectorate of Djambul region, the Committee of National Safety and the Police all аinvestigated the case. So far as is known, the leopard has not been brought into the region, nor had it been kept in a zoo or privately. There had been no reports of a leopard having escaped from any other establishment (e.g. a traveling circus). The conclusion is that this was a wild leopard killed on the banks of the Talas river. The killing of a West Asian leopard in Kazakhstan represents is of great scientific interest. There are not prior literary reference to leopards in Kazakhstan nor any sightings reported. The leopard is found in the foothills and mountains in the south of Turkmenistan, in Uzbekistan and in Tajikistan. 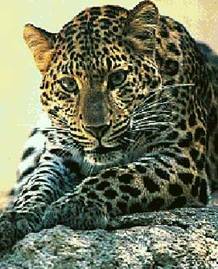 Leopards are found Turkmenistan in the southern part of Usturt, in Large Balhan, Small Balhan, Kjuren-dag, Kopetdag, Badhyz. In Uzbekistan, the leopards are found in the foothills of the Babatag range. In Tajikistan, they are found on the right bank of the Amu Darya river, in the area between Kafirnigan, Vazh and Pjandzh rivers to the east up to the foothills of the Darvaz range and to the north as far as the Gissar Valley (Geptner & Sludskiy, 1972. Sokolov, 1963). The Babatag range and the Gissar valley are the nearest places where the leopard was found in Kazakhstan. The distance between there and the Mujunkum desert is 600 km. From Turkmenistan, the distance is 1,200 km. It is not certain from which area the leopard came. In both cases, in addition to the considerable distances, the animal would have to overcome many natural barriers, such as the Pamir mountains, the Kyusylkum Desert, and the Amu Darya and Syr Darya rivers. It is possible that the leopard traveled along the foothills of the Pamirs, then proceeded via the Ugam and Pskem rangers into the Talas valley and along the lower partof the Talas river. A factor favouring this theory is the mild winter of 1999/2000 when there was little snow. However, it should be noted, that it is not known how or when the leopard first arrived at the Talas river. Distant migrations of Felidae are known to science. For example, there are records showing leopards travelling more than 600 kilometers. The ability of the species to overcome great obstacles is documented (Koshkarev, 1992). Similarly, distant migrations of the puma (Puma concolor) are known (Bibikov, Karavaeva, 1976). Leopards may even have lived in the Muyunkum. The lower Talas valley is a wild and lonely place. The floodlandТs brushwood provides good cover, and good fodder is provided by gazelle (Gazella subgutturaza), saiga antelope (Saiga tatarica), wild boar (Suc scrofa), hare (Lepus capensis), rodents and birds. The leopard has a wide hunting range,and is mobile. Due to its innate caution, amazing camouflage and habit of traveling at night, it is rarely seen (Gorelov, 1971). The West Asian leopard is a strong, daring and clever predator. In some areas its kills of domestic animals are significant (Lukarevskiy, 1988). Probably, if leopard were present in the Talas Valley attacks on domestic cattle would have been known. But, on the other hand, the food base of the West Asian leopard can equally be wild animals (Korshunov, 1985). What is more, rural economic conditions in the desert abd steppe regions of the Mujunkum have changed greately in the last 10 years. Since the collapse of the collective farms, the number of sheep pens has been drastically reducad and in many places they have disappeared completely. Cattle no longer graze there and cutting of saxaul (Haloxyon spp.) for wood and building has stopped. Agriculture has also ended. Reed and riparian thicket have been burned for 10 years. Periodic burning also served to limit the spread of another animal with a similar biology, the Caspian tiger (Panthera tigris virgata), which existed in this area in the 1880-1890s (Sludskii, 1939, the Red Book of Kazakhstan, 1996). The artesian wells have stopped working, and visits by man or vehicle has been reduced. Naturally, these economic changes have had a positive effect on restoring vegetation and on the number of wild animals. 1 Ц Availability of food in the area, the presence of main prey species, places of conclealment, for observation, and for storing food. 2 Ц Limited snowfall, or brief duration. 3 Ц Lairs for rearing cubs. The flood plain of the Talas river in the Mujunkum desert fulfils these conditions completely. Therefore it is necessary to carry out research to determinate the number of leopards in the Talas river valley; to undertake a thorough survey of the spoor of wild and domestic animals at watering places; and to question the local population. The results of such an investigation will enhance the significance of the first appearance of leopard in Kazakhstan. 10. Sokolov I. I., 1963. The mammals of the U.S.S.R. fauna. T. 2., M.-L., pages 640-1102.